Libbie Mill — a $434 million, live-work-play community being developed by Gumenick Properties in Henrico County — took home the 2015 Project of the Year Award Tuesday evening during an annual awards event honoring top commercial real estate projects in the Richmond region. More than 200 members of the real estate community gathered at the Country Club of Virginia in Richmond for the awards presentation sponsored for the 14th year by the Greater Richmond Association for Commercial Real Estate (GRACRE). The program recognized outstanding examples of design and implementation in the Richmond market during 2014. In all, GRACRE honored six local transactions and nine projects ranging from entertainment, The Beacon Theatre in Hopewell, to the historic adaptation of the Cookie Factory Lofts into apartments in Richmond. Taking home the top prize was the group’s largest project. Libbie Mill is a 79.5-acre infill site along Staples Mill Road off I-64 in Henrico County. At total build out, the mixed-use community plans to offer 2,000 housing units, 60,000 feet of office, a 53,000- square-foot Southern Season store, which is already open, 100,000 square feet of retail shops and a new 50,000-square-foot Henrico County library scheduled to open in 2016. Gumenick Properties donated the 3.3-acre site for the library. The development company has relocated its own offices to the 4901 Building, the first office/retail building at Libbie Mill, which was completed in 2014. Richmond Memorial Health Foundation also has its headquarters there. Organizations were invited to nominate projects and transactions by submitting entries with a project narrative, photo documentation, and list of contractors, consultants and other project information. The award winners were selected from a pool of 44 nominees. 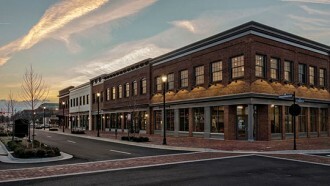 · Project of the Year: Libbie Mill, $434 million (with $59 million invested so far), Gumenick Properties, Henrico County. · Best Suburban Multi-Family Project, Marshall Springs at Gayton West, $72 million, 420 units, The Breeden Co., Henrico County. · Best Urban Multi-Family Project, 1200 Semmes Apartments, $14 million, 123 apartments, 1200 Semmes LLC/Miller & Associates, Richmond. · Best Office Project: Teleperformance Customer Service Center, $1.3 million, Teleperformance USA, Henrico County. · Best Hospitality Project, First Freedom Center Residence Inn/Courtyard by Marriott, $36 million, Apple Hospitality REIT Inc., Richmond. · Best Cultural Project: The Beacon Theatre, (gross value not disclosed), Beacon Theatre 2012 LLC, Hopewell. · Best Historic Adaptation: Cookie Factory Lofts, $40 million, 178 apartments, Interbake Partners LLC, Richmond. · Best Food and Beverage Project: Ardent Craft Ales Brewery & Taproom, (gross value not disclosed), Richmond. · Best Sale Transaction - Office: Highwoods Portfolio (11 suburban office buildings), $40.6 million, 359,162 square feet. Broker: Cushman & Wakefield | Thalhimer, (Eric Robison). · Best Sale Transaction - Industrial: Enterchange Portfolio, $31.2 million, 502,395 square feet. Broker representing buyer: Cushman & Wakefield | Thalhimer (Eric Robison and Evan Magrill). Broker representing seller: Cushman & Wakefield | Thalhimer’s Capital Markets. · Best Lease Transaction – Urban Office: The Martin Agency at One Shockoe Plaza, lease value: $34. 8 million, 16 years; 118,518 square feet. Brokers: Highwoods Properties (Jane duFrane) and JLL (Ned Roberts). · Best Lease Transaction – Suburban Office: McKesson Medical-Surgical Inc. at Deep Run III, lease value, $34 million, 10 years; 168,500 square feet. Broker: Cushman & Wakefield | Thalhimer (Mark Douglas and Austin Newman). · Best Lease Transaction – Medical Office: Sheltering Arms at Reynolds Crossing, Lease value, $4 million, 10 years; Brokers: CBRE | Richmond (Trib Sutton, Malcom Randolph, Bill Reynolds, Will Bradley and Scott Durham).